Your freedom and future are at stake when you are facing serious legal problems. Depending on the outcome, the consequences for you and your family can be catastrophic. You need to know your options. You also need to know that as our client, you are important to us. 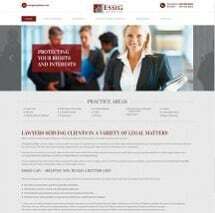 We take a personal interest in your legal matters. On your behalf, the lawyers at Essig Law Office will provide sound advice and compassionate counsel. The father and son team at Essig Law Office combines more than 50 years of experience serving the legal needs of area residents throughout Woodford County, Tazewell County and the greater Peoria area. Our attorneys have worked hard to solidify our reputations for honest and ethical representation. During your initial consultation at our law firm, we honestly assess your case and tailor strategies based on your specific situation and goals. We strive to put your best interests first by resolving problems quickly without creating needless legal fees. Whether you are facing a divorce or criminal charges, needing help with a car accident claim, or pursuing an estate plan or bankruptcy, you need the help of a skilled and experienced Washington-based attorney.